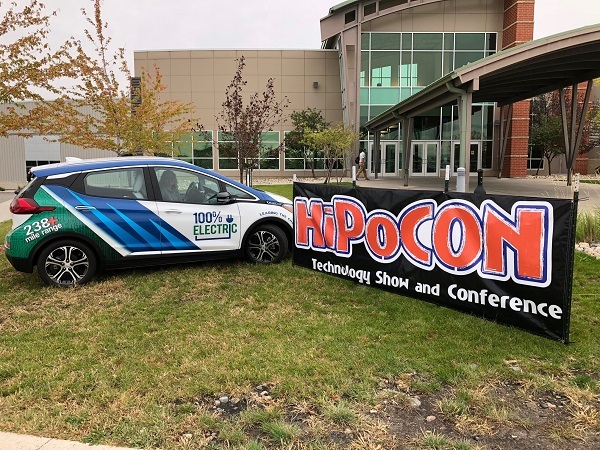 When Minnkota network specialists Sarah Lundeby and Casey Hancock started making travel plans for the HiPoCon Technology Show and Conference in Fargo, they decided to go all in on the technology theme of the day. They booked the Bolt for the 80-mile drive to Scheels Arena, excited to experience a long-range trip with the EV for the first time. The IT duo left Grand Forks with an expected range of 181 miles – not a lot of wiggle room for the 160-mile round trip, but enough. Sarah had perfect weather for her portion of the drive, and she set the cruise to the highway speed of 75 mph. They arrived on time and in style, confident that the remaining 100 miles of range would get them back to Grand Forks without an issue. "We did tell a handful of conference attendees that we took the car down," Sarah said, adding that she fielded several questions about it. She also noted that her favorite part of having the car was the loud and proud design of the car wrap. "I’m representing Minnkota when out and about!" After a day of mingling with other technology professionals and learning about the latest innovative developments in IT, it was Casey's turn to take the wheel for the drive home. His leg of the trip wasn't so easy. On the drive north, a harsh headwind and heavy rain pummeled the car, and the battery's energy started dipping quickly. Casey lowered his speed to just above 60 mph and used any opportunity to follow the draft of semis on the road. As they drew nearer to Grand Forks, their battery power continued drop, so they started turning off smaller functions like climate control and radio. Ultimately, they arrived back home with less than 10 miles of range – a close call! Sarah and Casey arrived back at headquarters in the low battery warning zone. Count that as a first for the Minnkota team! 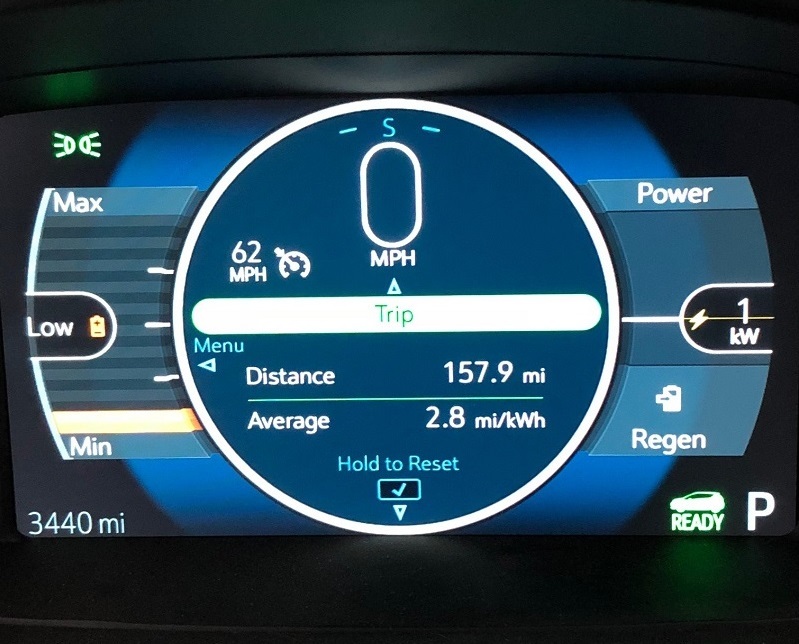 Sarah says she learned that a lot needs to be considered when taking an electric vehicle on an extended trip. "You need to be conscientious of your battery range and how the weather conditions affect your range. Do not assume this is just like a fuel operated vehicle," she said. "It will be interesting to see how the range is affected during the winter," Casey added, reflecting one of the top inquiries Minnkota hears when out in the community with the car. Even with a heart-pounding finish to their journey, both Sarah and Casey said they had a great time with the car and look forward to taking it on the road again. "It was fun to drive!" Casey said. "The acceleration is crazy compared to a normal vehicle." Sarah told us she enjoyed the smooth, quiet ride, the cabin's roominess and, of course, the pep! "I love the car," she said. "It’s such an amazing addition to our fleet."